As the world standard for UCI Challenge Classes, our Crescent-8 starting system is another example of how Pro Gate is working to evolve safety and innovation in the sport. 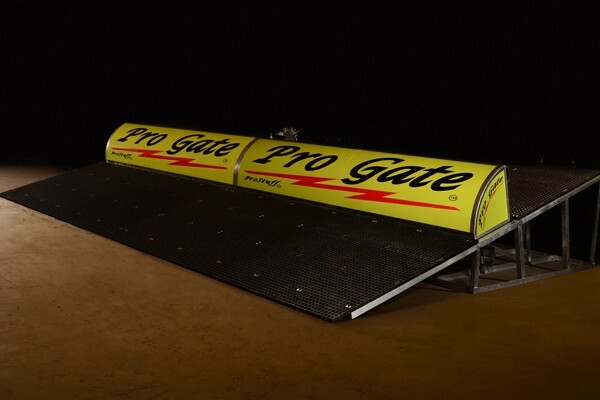 Following a successful rollout last year, Pro Gate Crescent-8 is catching on worldwide as the de-facto “safety gate” for top tracks. As a modular system, choose the full kit (starting deck, drop section and launch ramp), or “sink” only the drop section into a pre-existing starting hill. Crescent comes equipped with the hyper-reliable Pro Gate ram, brain box, and starter controls; and we offer a deep list of “original equipment” accessories and options. Call, or complete the form below now for a free consultation on how the Crescent-8 system and our “Gatekeeper” line of maintenance products can work for your track. Our staff can also be on-site to ensure your installation goes down as smoothly as your gate.